In the past three years, the bank's advances grew even faster at 27.85 per cent CAGR, while in 2015/16 it grew by 29.99 per cent, according to BT-KPMG study. Growth in deposits clocked 18.61 per cent CAGR in the three-year period, but picked up pace in 2015/16 to 22.53 per cent. Yes Bank, India's fifth largest private sector bank, has steadily built its business edifice on three pillars - corporate, retail and SMEs. Over the past six years, the bank's advances have grown by a compounded annual growth rate (CAGR) of 24 per cent, deposits rose by 21 per cent and total assets grew by 24 per cent CAGR. In the past three years, its advances grew even faster at 27.85 per cent CAGR, while in 2015/16 it grew by 29.99 per cent, according to BT-KPMG study. Growth in deposits clocked 18.61 per cent CAGR in the three-year period, but picked up pace in 2015/16 to 22.53 per cent. The bank's fee income and operating profits rose by 25.23 per cent and 32.40 per cent during the past three years and in last fiscal, respectively. "Overall FY16, despite challenging headwinds, has proved to be extremely satisfactory for Yes Bank," Rana Kapoor, Managing Director and CEO, Yes Bank, had announced some time ago. In fact, Yes Bank was adjudged the Best Mid-sized Bank for its performance in 2015/16. Since it was founded in 2004, Yes Bank's strategy has been to identify focus segments and offer a complete suite of asset and liability products, with an overlay of customer relationship management (CRM) analytics and digital channels for enhancing productivity and servicing. Its three-pronged strategy of customer acquisition, engagement and retention also helped it to gain ground. "Going forward, this will catalyse cross-sell proposition, which is now complete with an entire bouquet of retail asset products," says Kapoor. Yes Bank has also expanded its branch network on a hub-and-spoke model to boost customer acquisition, increase CASA balances, and share of retail advances and fees. The bank's CASA ratio was at 30.30 per cent last September, against 25.5 per cent in the year-ago period. Savings account deposits posted robust growth of 53.6 per cent year-on-year. "The bank has taken a leadership position in digital banking and social media, through the ART (Alliance-Relationship and Technology) framework, and creating innovative solutions and capabilities to deliver enhanced customer experience for corporate, SME and retail customers," says Kapoor. 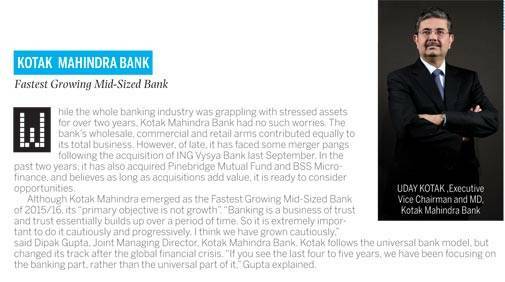 According to Kapoor, Yes Bank has a seasoned corporate and SME banking franchise, segmented across 12 business units providing an end-to-end, customised solutions across eight to 10 identified focus sectors in each segment. The bank also follows a segmented strategy geographically. "This ensures the bank is well geared to address the entire basket of the economy, and calibrate business development and risk management across these sub-segments," Kapoor adds. Consumer banking and MSMEs are the other focus areas that would provide the necessary impetus to the bank's growth and increasing market share. The past few years have been challenging for the banking sector, beginning with currency volatility leading to rate actions by the RBI in July 2013, and the subsequent credit crisis as a result of the global economic slowdown and high corporate leverage. "Despite these challenges, Yes Bank continued to show resilience on all asset quality parameters. This is attributed to our 'knowledge banking' approach with an in-depth understanding of focus sectors, our three-tiered risk management framework, and an ingrained culture of risk management," says Kapoor. To differentiate itself from peers, Yes Bank has adopted a 'knowledge-driven' approach to offer financial solutions to sectors such as food and agribusiness, telecommunications, information technology, life sciences, renewable energy, media and entertainment, manufacturing and textiles. "The bank's concurrent investment in network, people and technology coupled with stable asset quality outcomes, has resulted in achieving sustained business growth, strong profitability and a stronger and more vibrant brand," says Kapoor. Currently, the bank's retail banking portfolio is at 33 per cent of advances, while corporate banking is at 67 per cent. By 2020, it plans to increase retail to 45 per cent. "The diversity in portfolio will initially be contributed by well established and seasoned SME franchises, while from 2018 consumer retail will generate a multiplier effect and will be a key driver for growth," says Kapoor. To complement its core banking product suite, Yes Bank has already launched a wholly owned subsidiary, YES Securities. It has also obtained an in-principle approval from Sebi for its asset management business. "However, capital-intensive businesses like insurance can be a drag on a bank's balance sheet, and value destroyers, and are, therefore, best offered through alliances," Kapoor adds. The bank has tied-up with Max Life for life insurance and Bajaj Alliance for general insurance. "Today, we have all the engines in place to grow at over 30 per cent organically," says Kapoor, adding: "Having said that, we remain open to evaluate any suitable opportunities in specific businesses such as securities and asset management."